After the World Poker Tour Doyle Brunson Five Diamond event concluded in Las Vegas, the action left the United States and split for two major stops on different continents. Both of them started on December 15, and the known tournament grinders had to choose which one they want to take part in. Since the distance between them is quite big, the choice was mostly influenced by the region. One of the tournaments is the inaugural WPT Korea at the Ramada Plaza Jeju casino in South Korea. It is only the third time in WPT history that the circuit has a stop on the Asian continent. However, the other two were not recognized as official WPT stops and were considered as being National events in China. This makes the WPT Korea the first time that the main circuit includes a stop in an Asian country. The officials haven’t yet mentioned what numbers they were looking forward to see for the tournament but the two starting days had a total of 137 players at the tables, making the prize pool worth $358,803. Some familiar faces took to the tables at the luxurious casino. With the High Roller also taking place alongside the Main Event, some players opted for the smaller and more expensive tournament, including John Juanda. Recent WPT trophy winner Tony Dunst was looking to add another title to his resume in Korea, joined by Raymond Chow in the Main Event. However, none of them made it past Day 1A. The WPT Korea will conclude in Thursday. More than 5,000 miles away, the World Poker Tour began the festivities for the Prague stop on Sunday. The Card Casino is hosting the many players coming out for the event in the picturesque city for the latest addition to the WPT in Europe. Since these are the last two stops for the WPT before players go on holiday, quite a few top pros made an appearance in Prague. It is the third year in which this stop has been part of the schedule and notable pro players won the first two. Andrey Pateychuk took down the inaugural Prague Main Event in 2011 and Marcin Wydrowski won the WPT tournament the following year. The WPT Prague is considered as the last big chance for players to win big in 2013. The European Poker Tour is also taking place in Prague, so there is plenty of action in the Czech Republic capital going on right now. 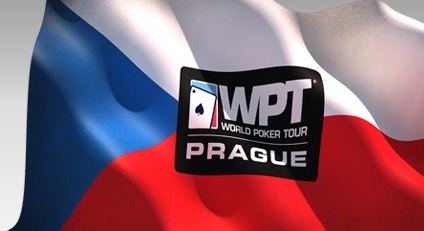 The WPT Prague will crown its champion on Saturday, closing the schedule for the 2013 calendar. The next stop will be in late January, as the WPT returns to the US, at the Borgata casino in Atlantic City.